Nurses need to be ethical, compassionate, dependable, mature, and self-disciplined. They must also exercise good judgment, have patience and strong problem-solving, interpersonal and communication skills, and be able to work well with others. Nurses need to be able to multi-task and to handle stress well in a complex and fast-paced environment. This occupational group includes registered nurses, registered psychiatric nurses and graduates of a nursing program who are awaiting registration (graduate nurses). Specific duties for occupations within this group are outlined under Special Duties. give nursing care at work sites to employees, customers, and others with minor injuries and illnesses. Nurses mainly work in health-care facilities, such as hospitals, clinics, residential facilities, and doctor's offices as independent practitioners or team members. Community and public health nurses travel to patients' homes, schools, businesses, community centres or other sites. Most nurses work 8 to 12 hour shifts, usually on rotation, including weekends, evenings, nights and holidays. On average, full-time nurses work 36 to 40 hours per week and part-time work is quite common. Nurses use lifting devices and follow safety procedures to reduce the risk of workplace injuries and illness. New technologies and policies have resulted in a patient's reduced length of stay (i.e., more day surgeries are performed), which adds to the workload. Nurses have to cope with the emotional aspects of working with the sick, injured and terminally ill, as well as patients' families. The Canadian Nursing Association (CNA) offers a voluntary certification program that allows registered nurses to write a national exam in one of 19 areas of specialization. For a list of these programs and their descriptions see the CNA website at www.cna-aiic.ca/CNA. A growing and aging population will require more health services, which will result in an increased demand for registered nurses and registered psychiatric nurses. Government has annually increased funding for health services and facilities, which will contribute to the increase in new job openings for nurses. 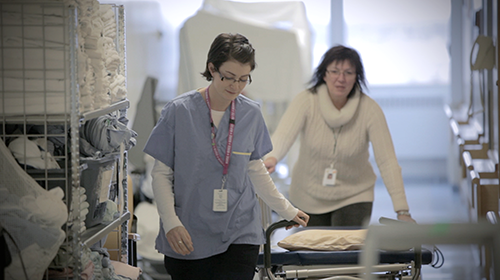 The current demand for nurses in all regions and settings in the province is strong. However, the current supply of nurses and new graduates is in short supply, particularly in northern and rural regions. To address this situation, the B.C. provincial government has created additional training spaces in public post-secondary institutions, and has offered loan forgiveness to nursing graduates who commit to work in under-served regions of the province. The demand for nurses in specialty areas, such as operating rooms, emergency rooms and critical care is also strong, with many openings in the Mainland/Southwest region. In addition, experienced nurses and specialty nurses are also needed to teach students and train new graduates. The demand for nurse educators is increasing as many current nursing educators are nearing retirement. Other areas, such as medical-surgical units are also having a hard time recruiting and retaining registered nurses. The role of nurses is expanding as governments consider ways to control increasing health-care costs. One approach is offering basic care through a mixed team that consists of doctors and other health professionals. Nurses would work alongside doctors and provide patient care in situations where a doctor's skills are not required. These workers are called nurse practitioners, which is a new, self-directed role for nurses. The number of registered nurses and registered psychiatric nurses working in residential/complex care is expected to decrease due to cost pressures and the current shortage of nurses. There is also a trend towards providing assisted living rather than intermediate care facilities. This will further reduce the employment opportunities for registered nurses and registered psychiatric nurses in complex care. As a result, several health-care authorities are now introducing LPNs into home care nursing. Some individuals may work as health-care aides or practical nurses before beginning education for registered nursing. Registered nurses typically start in an entry level position in a medical or surgical unit. Registered psychiatric nurses typically start in an entry level position in an acute psychiatric unit or a tertiary mental health care facility. Increasingly, new graduates are finding employment in community health and specialty areas where new graduates were not previously hired until they gained experience. With additional certification, registered nurses may specialize in areas such as emergency care, oncology, psychiatric care, critical care, pediatrics, geriatrics, palliative care, rehabilitation or occupational health. With additional experience and/or education, registered psychiatric nurses may specialize in forensic psychiatry, emergency mental health, crisis stabilization, eating disorders, child and youth mental health, withdrawal management, perinatal mental health, developmental disabilities or psychogeriatric care. With experience and additional education, nurses can become clinical nurses, nurse educators, nurse managers, care coordinators, clinical nurse specialists and nurse practitioners. Registered nurses and registered psychiatric nurses may progress to supervisory and managerial positions with experience and additional courses.